When it comes to asset management, many organizations continue to be hampered by high costs, a high volume of unplanned failures and, ultimately, an unacceptable level of risk. The reason? There’s a piece missing in their asset management puzzle. That piece is called Asset Strategy Management (ASM). It’s a simple – but vital – component of any asset management or reliability improvement initiative. Does your maintenance plan cover all the basic equipment care fundamentals and statutory or regulatory requirements – on all assets? Answering ‘no’ to one or more of these questions sends a clear signal that you would gain immediate value from implementing ASM. Once an asset has been selected and installed, its ongoing reliability is determined by two things: how it is operated and how it is maintained. Putting operations aside for moment, how you maintain an asset will directly impact its performance. And to decide how and when that maintenance is conducted, you need a strategy. Hence, an asset’s performance all starts with a maintenance strategy. At the most basic level, there aren’t many options for setting a strategy. You can either decide to execute a task at a regular interval to prevent or predict a failure; or you can monitor the asset for specific failure mechanisms, with an alarm or alert triggered if remedial action is needed. It sounds easy enough. Yet many organizations will set a strategy in the first instance – upon installation of the asset – and leave it at that. There’s no ongoing management of that strategy. The implication of this is that, over time, the strategy may no longer be appropriate for how the asset’s being used. Or, someone may change the strategy without proper review or justification. Think about it. If someone goes into the EAM system and changes an interval of one of your maintenance plans without any review – and it turns out to be an inappropriate change – imagine the risk to your business. Since strategy is the single biggest driver of asset performance, it must be managed effectively to ensure it remains optimal for the life of the asset. Enter ASM, a process that integrates with work management, but with a very different objective. Whereas work management is all about the efficient execution of work, ASM is all about making sure you are executing the right work – all the time. Many organizations have unsuccessfully tried to tackle ASM within their work management process. The reason this approach doesn’t deliver results is that ASM and work management have very different objectives and therefore require entirely different triggers, resources, data and technical solutions to be effective. Organizations typically see an immediate uplift in performance and reduction in costs on implementing ASM. The clarity generated from an ASM program can also improve work management, because the objective of the work management process become singular and clear, allowing the organization to do work more efficiently. How does Asset Performance Management (APM) fit in? Some organizations may be familiar with APM, which is focused on maintaining asset health and condition. APM manages the ongoing performance of assets by monitoring current conditions or current performance data; and alerting the organization when an intervention is required to prevent an impending failure. Types of monitoring range from a periodic assessment by a technician through to multi-parameter continuous monitoring devices. Essentially however, the intent is the same: understand the condition, determine if that condition is deteriorating and identify any impending failure so that rectification can be scheduled into the workflow. And, in doing so, avoid that failure. Recently, the cost of technologies that support the online monitoring of asset operating parameters has fallen, leading to wider-scale adoption of online monitoring tools. APM, as a result, is getting cheaper and easier to perform. It’s good news for organizations – but it’s important to remember that these monitoring tools don’t take care of strategy. ASM sits alongside APM to make sure that routine maintenance strategies and whole of life asset strategies are best-in-class and aligned to the performance requirements of the plant. It uses a consolidated base of Reliability Master Data that is deployed and connected across the entire asset base. Any updates to strategy follow a process to ensure that the change is effective (data-driven where applicable); and work-flowed to ensure review, approval and implementation. This may result, where applicable, in a single site-based change, driving the update of the corporate Reliability Master Data, and the resulting change being deployed automatically across an entire asset base. ASM can also help to identify where it is cost-effective and practical to implement monitoring or APM. Hence, along with work management, you have a closed loop for reliability maintenance. Most organizations will already have a work management process in place. Ideally, this process has been refined to ensure that assets are maintained and repaired quickly to minimize downtime. But if you’re serious about asset maintenance then your next step is to implement an ASM plan. It’s the most effective way to deliver improvements, reduce costs and improve your existing work management processes. Why? Because any reliability process must start with a strategy aligned to your performance goals. This strategy must be best-in-class and continually managed – it can’t be changed ad-hoc, without review and approval. By the same token, if effective local strategy changes are made, it is a waste not to electronically distribute that change to all relevant instances of that asset. Implementing an ASM process puts the organization back in control of asset management; and will continually drive the execution of best-in-class strategies across the entire asset base. Where does your organization sit on the Asset Strategy Management maturity scale? Find out how you compare to best-in-class Reliability programs on this and other key measures with our short 12-question Asset Strategy Management Assessment and receive a custom report with our recommended path forward. An often-overlooked element of implementing any new initiative is the process mapping exercise. The more intricate the initiative, the more valuable the process map becomes. Although launching a root cause analysis implementation plan is usually fairly straight-forward, it is still worthwhile spending some time mapping out how the work flows from a triggered event all the way through tracking the effectiveness of implemented solutions. It’s an effective way of ensuring that everyone has a clear understanding of their role and where it fits into the process. Process mapping is usually done in two-steps commonly known as the brown paper/white paper exercise. The brown paper mapping step creates a diagram representing how RCAs are currently managed throughout the system. Once the existing workflows are clearly understood and charted the white paper charting is performed. This diagram documents the desired workflow and systematically identifies gaps between the current and desired future state. Identifying the nature and magnitude of these gaps allows the Facility Leadership Team and/or RCA Steering Committee to dedicate the resources needed to make the change over. It also clearly defines the roles and responsibilities of affected departments and positions in the RCA program. As seen in the example below, different symbols and colors are used to represent various steps and components. The steps are laid out from left to right and top to bottom. A start or stop point is usually designated with an oval or rounded rectangle, a regular step is a rectangle and a decision point is a diamond. All steps are connected by lines and arrows. 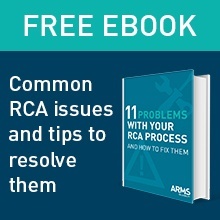 When done properly, process mapping leaves no room for misunderstanding of what needs to be done when or voids in roles/responsibilities, resulting in efficient and effective implementation of the RCA initiative and ultimately, operational improvements. Stay tuned for our next installments on Change Management and Implementation Tracking. Your company is going through an asset management initiative and they need ‘reliability engineers’ to support this new focus. One day your title begins with ‘Maintenance _____’ and the next day you come into the office and the title on your door now reads ‘Reliability _____’. Undertaking new asset management initiatives as a newly titled “reliability engineer” can be daunting. Reliability Engineering isn’t typically something one would go to school for or get a certificate in, so what does an R.E need to know? To be successful at increasing the reliability of your plant, reliability practitioners should utilize these ‘tools’ that can deliver the best results, applying them based on the type of problem you’re facing. It’s essential for a newly appointed reliability professional to be aware of common maintenance issues. The more time maintenance personnel spend fighting fires, the more their morale, productivity, and budget erodes. The less effective routine work that is performed, the more equipment uptime and business profitability suffer. 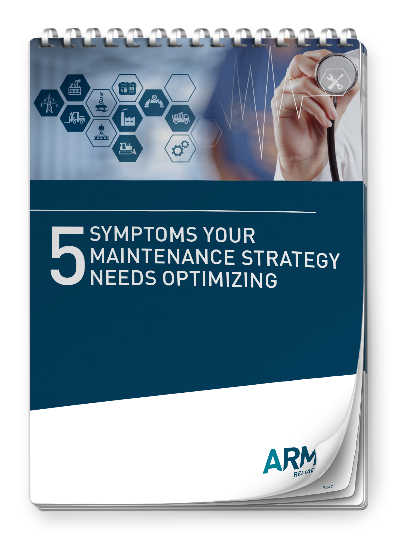 Here’s the good news: An optimized maintenance strategy is simpler and easier to sustain than a non-optimized strategy, resulting in fewer issues and downtime. It’s easy for organizations and new reliability engineers to be intimidated by the idea of maintenance strategy optimization. An important tip to remember is that small changes can make a huge difference. Maintenance optimization doesn’t have to be time-consuming or difficult, nor does it have to be a huge undertaking. By creating a framework for continuous improvement and understanding the methods to employ, you can ultimately drive towards higher reliability, availability and more efficient use of your production equipment. Join us at the Reliability Summit, March 26-29, 2019 in Austin, Texas to learn the essential tools in a Reliability Engineer’s toolkit and how to apply them to achieve operational success.